Every year on 25 March, the International Day of Remembrance of the Victims of Slavery and the Transatlantic Slave Trade offers the opportunity to honour and remember those who suffered and died at the hands of the brutal slavery system. The International Day of Solidarity with Detained and Missing Staff Members is observed annually on 25 March by the United Nations. It commemorates the anniversary of the abduction of Alec Collett, a former journalist who was working for the United Nations Relief and Works Agency for Palestine Refugees (UNRWA) when he was kidnapped by armed gunman in 1985. His body was finally found in the Bekaa Valley, Lebanon in 2009. 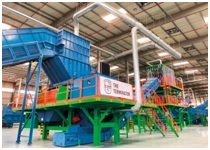 The world’s largest e-waste recycling facility has located at the Dubai Industrial Park, the 280,000 square feet plant will process Waste Electrical and Electronic Equipment (WEEE), IT asset disposition (ITAD), refrigerant gas and specialised waste. Oslo Municipality is working with Finnish utilities firm Fortum to install charging plates in the road that connect to energy receivers in the vehicles themselves, making Norway the first country in this area. The goal is to make it as easy as possible to charge electric taxis, as doing so now is cumbersome, time-consuming, and expensive. Norway wants all new cars to be zero emission by 2025 whereas other nations, like Britain and France have similar goals for 2040. In Maharashtra, Election Commission has come up with a mobile application called ‘PWD’ for making voting easier and implement the poll body’s slogan of Accessible Elections for over two lakhs Divyang voters across the state. The central bank of the country has appointed 5-member committee under the chairmanship of Nandan Nilekani to further deepen digital payments and enhance financial inclusion through Fintech. Govindaraj was unanimously re-elected as president of the Basketball Federation of India (BFI). Chander Mukhi Sharma was re-elected secretary-general as the BFI promised a bunch of new ideas and tournaments. He represented India inmen’s high jump F-42 category during 2012 Summer Paralympics games held in London, where he clinched silver medal. With this, he became the first Indian to win medal in this category. 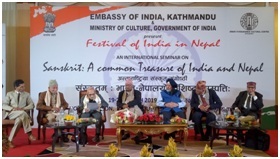 The three day seminar is culmination of a month-long Festival of India in Nepal which is being organized by the Embassy of India and Ministry of Culture. A panel of 10 world renowned Sanskrit scholars from India and 35 senior Sanskrit professors from various parts of Nepal will present their research papers on different topics including Sanskrit language, literature, Ayurveda and Yoga during the seminar. Samsung, Tata Motors, Apple, Hero MotoCorp and Nike are the top-five consumer-focused brands in the country, according to TRA. ‘India’s Most Consumer-Focused Brands 2019’, measures brands on their increase in buying propensity index over the previous year. HDFC is the top amongst Banks in the list and is at the 8th spot. While for Top PSU Bank, SBI is the leader at 12th position overall. Air Chief Marshal BS Dhanoa announced the induction at a ceremony held at Air Force base in Chandigarh. Chinook helicopters will be deployed at Chandigarh’s Air Force Station 12 Wing. The second batch of Chinooks will be stationed in Assam’s Dinjan. 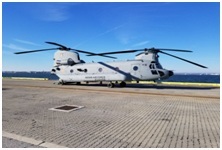 India bought 15 CH-47F (I) Chinook helicopters in September 2015 from Boeing (United States) at a cost of $1.5 billion. The entire fleet of 15 Chinooks is expected to be inducted in the air force by March 2020. These choppers will be used for various military purposes such as deploying of troops and machinery at high-altitude locations along the India-Pakistan border to support country’s current and future security goals. The joint training exercise MITRASHAKTI – VI between Indian and Sri Lanka Army is being held at Diyatalawa in Sri Lanka. The NBCTF, christened “Abhedya”, impenetrable in Sanskrit, will help train personnel of naval ships fitted with nuclear, biological and chemical detection and protection systems. The Goa Shipyard Limited had signed the contract with the Indian Navy for the construction of the facility in March 2016.
eBay announced adding Google Pay to its suite of payment options as part of its move to intermediate end-to-end payments on its marketplace. With the integration, Google Pay users will be able to complete purchases on eBay via the app, mobile web and on desktop from sellers participating in eBay’s managed payments program, while shoppers using the Google Pay digital wallet will be able to complete purchases on desktop. Earlier, eBay added Apple Pay as a payment method under its managed payments programme. Indian Space Research Organisation (ISRO) will launch 29 satellites including the primary payload EMISAT, on the first of April. Polar Satellite Launch Vehicle, PSLV-C45 will take off from Satish Dhawan Space Centre in Sriharikota. EMISAT has been developed for monitoring radar network by India. EMISAT, weighing 436 kg, is intended for electromagnetic spectrum measurement. It will be placed in an orbit of about 753 km altitude. 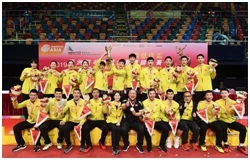 China defeated Japan 3-2 to win the 2019 Badminton Asia Mixed Team Championships. This was the second edition of the tournament. 11 teams including India was part of this tournament that was held in Queen Elizabeth Stadium in Hong Kong. The event was also known as the Tong Yun Kai Cup 2019 named after the president of the Hong Kong badminton association. In the mixed doubles, Chinese pair He Jiting and Du Yue has defeated apanese pair Yuta Watanabe and Arisa Higashino. In thewomen’s doubles, Li Yinhui and Du Yue won for China by beating Ayako Sakuramoto and Yukiko Takahata. Larry Cohen, the writer and director best known for his work in horror and films on exploitation of black people, including the cult classic ‘It’s Alive’, ‘Black Caesar’, and ‘Hell Up in Harlem’, has passed away. She got her first gramophone record at the age of 8 years. Her book Bhava Geetalu, a compilation of folk songs, was released in Chennai last year.